Nng… Ahhh… The Holidays. No matter what you celebrate, it’s a time set aside for warm feelings, and even warmer logs. 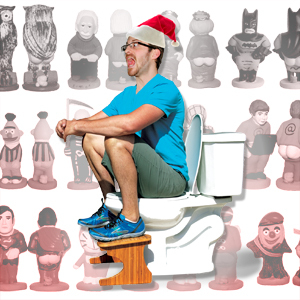 This year, we’ve got a special present just for Brandon: The Squatty Potty. Brandon has always scolded us for sitting on the toilet, not perching – turns out he was right all along! Thrill as Brandon receives his gift live on the air! After all, what better gift can you give than healthy bowels? But we don’t stop there- a product this amazing deserves some specialized holiday marketing ideas courtesy of Nerdy Show. Join Cap, Hex, Brandon, Tony, Jonna and Derpy Show’s boR, as we create jingles, ad pitches, and combined with the squatting enhancement of Squatty Potty, attempt to bring a little-known Holiday tradition from Catalonia to American shores. Thanks to Berto.El.Con for suggesting this microsode!